Easily the most anticipated part of Easter morning for most kids is their Easter basket. We both actually still get Easter baskets because we’re still kids to our parents (which is cool with us). Our Easter baskets have grown up a little bit over the years—now they’re filled with DVD’s and jewelry rather than stuffed animals. However, we’ve never gotten away from the essential filler: candy! Bake your cake mix according to the package directions in a round cake pan. 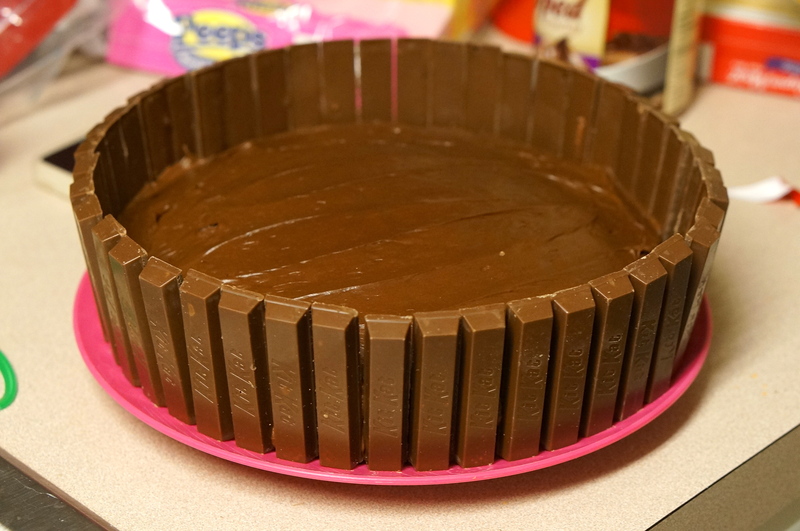 We opted to use just one layer of cake so the kit kats would stick up above the cake and it worked out really well. Frost the top and sides of your cake. 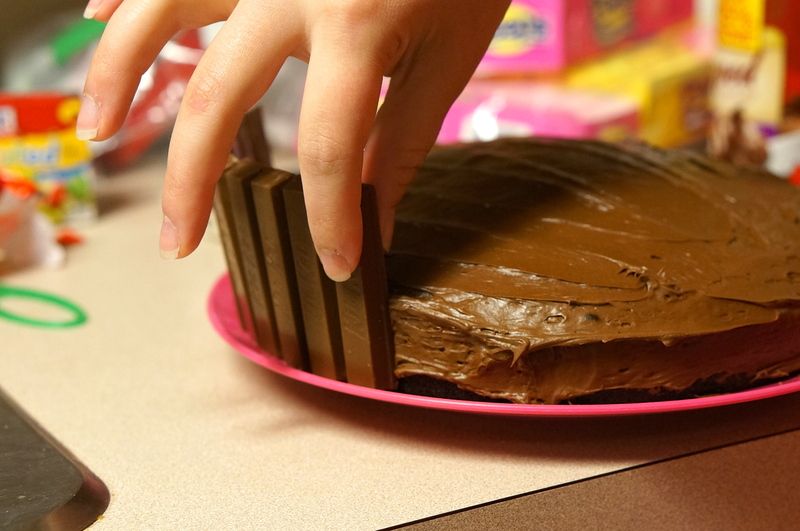 Stick the Kit Kat bars around the outside of the cake. Covere the entire edge of the cake. Now you have the base of your basket! 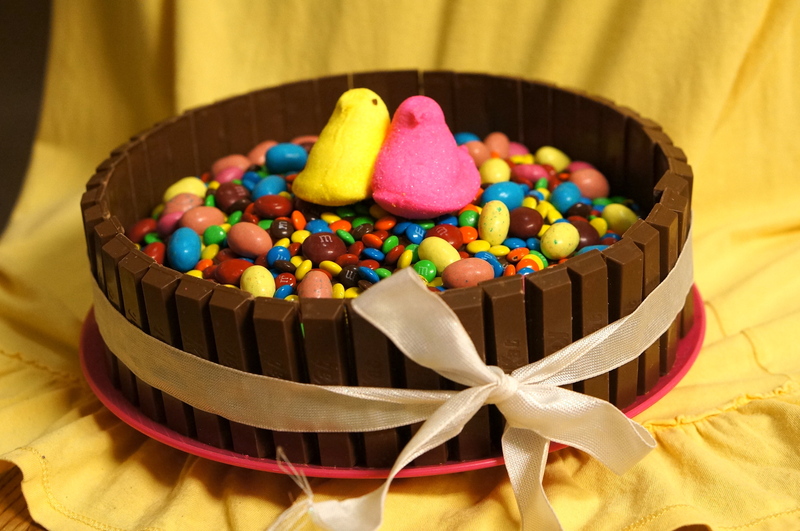 Cover the top of the cake with the candy of your choice. 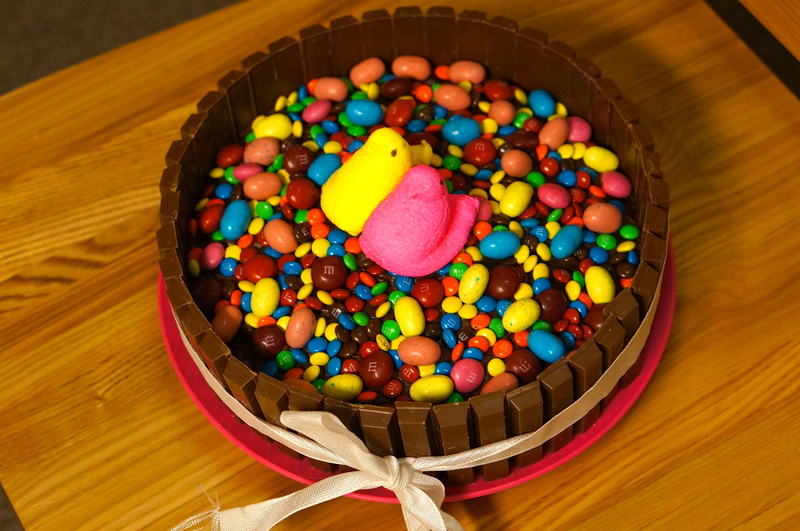 We used Mini M&ms and Robin’s Eggs. 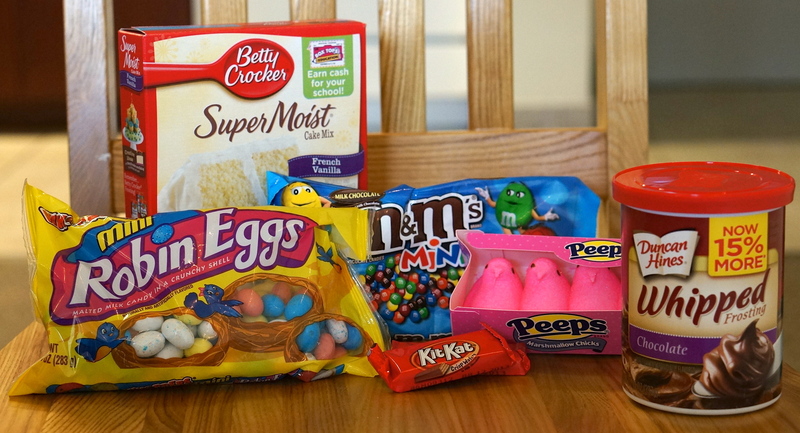 Place Peeps on top of the candy in your basket. You’re all done! Now you can tie a ribbon around the basket to make it even more adorable if you’d like. 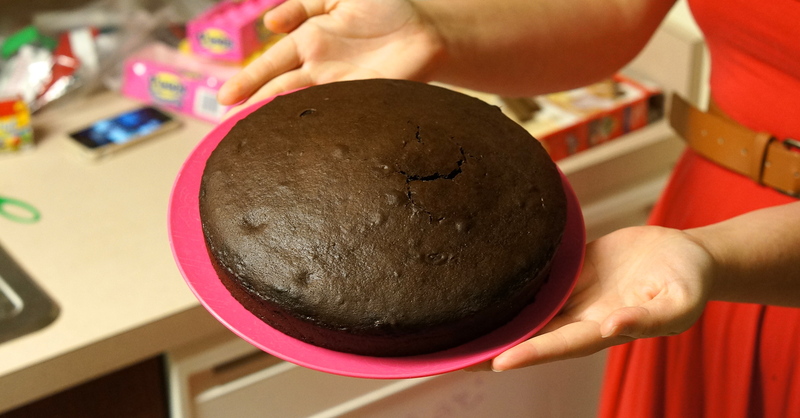 We really loved this cake once we made it. It looked so very like a basket that we couldn’t help but get excited for Easter coming. Amelia fed it to her friends and 10 out of 10 engineers liked it! If that’s not an endorsement, we don’t know what is. It looks like a professional magazine photo spread. Great job!! Adorable! Fun colorful and oh so yummy!! Thanks! It was actually a lot easier than we thought it was going to be. Have a Happy Easter! Thank you, it has been a lot of fun! Also thanks for all the support along the way 🙂 Happy Easter to you too! I’m late to the party, but I just discovered this blog, and I’ve been scrolling through everything. This is such a cute idea! I think it would look really cool if you mixed some green food coloring with shredded coconut and used that in place of the M&Ms so it looked more like grass. Either way, I think it needs to be Easter again so I can try this out.